RIO DE JANEIRO, BRAZIL – Petrobras will put six new oil platforms into operation in 2013, Brazil’s semi-public oil giant has announced, adding around 840,000 barrels of oil daily to the company’s current output capacity. It has also announced that gasoline prices will be increased in the new year, with the company emphasizing it was selling at less than world-market prices. 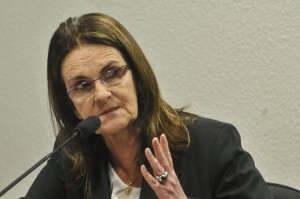 Petrobras President Maria de Graças Foster has admitted that prices will have to rise in 2013 to bring prices in line with the world market and to tackle poor results and high levels of debt, photo by José Cruz/ABr. Petrobras President Maria de Graças Foster said in an interview with O Globo newspaper that output and third-party production would increase “considerably” with the gradual introduction of the six new production units. Three of the new platforms – P63, P55 and P61 – would be run solely by Petrobras, and three others – labeled The City of São Paulo, Itajaí and Paraty – would be run jointly with partners. Petrobras hopes daily output in 2013 will be around two million barrels a day, including 80,000 for partner producers – up significantly on 2012, as the much talked-about pre-salt layer production comes online and starts to make an impact. The third-party portion of this could rise to around 100,000 barrels a day by the end of next year. Commentators say that, although Brazilians are relatively unaware of this third-party production, it is important for the industry, and as such, they are urging appropriate incentives and infrastructure investment, as well as for the domestic arm of the industry. Petrobras executives are banking on a better year in 2013, after revealing the company had encountered its worst-ever quarterly figures in the second quarter of 2012: it suffered losses of R$1.35 billion (US$665 million at the time), blamed largely on ballooning debts and costs in the face of a weakening Brazilian real. 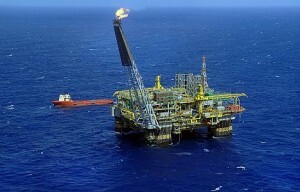 Petrobras aims to open six new platforms and increase production significantly in 2013, both for national and third-party production, photo by Divulgação/Petrobras. Recently the Petrobras president, who became the first woman to head the company in February 2012, said that onshore gas exploration would continue after the country imported 56 percent more oil in December, to 178,000 barrels daily. Ms. Graças Foster explained that there was a discrepancy in the price of gasoline (petrol) of around six percent, and four percent for diesel prices, and that this would have to be tackled with an increase in prices, although an exact date for this has yet to be announced and could be spread over time. She also touched upon about the difficulties faced by the government over the division of oil royalties this year, and said that any remaining issues must be ironed out so that new bids can be approached by oil companies “at full kilt” in the new year. Many have suggested that Brazil must now make sure outside investors and oil companies are not discouraged after the country’s very public chastising of US oil giant Chevron, after a moderate leak off the Brazilian coast over which it was fined and banned from new contract bids. Among them is American expatriate Jim Kappeler, who works in the Rio oil industry, who said in an interview with The Rio Times in November that it was still unclear what exactly a realistic outlook of what can be expected from pre-salt reserves in the coming years would be, as the extraction process was experiencing delays due to the complexity of the infrastructure.